In Periodization Training For Sports, the author, Tudor Bompa, explains how to create a year-around training program that progressively prepares your body for peak performance through strength and power training. Ultimately, they all lead up to peak performance going into the competitive season. The first phase is called anatomical adaptation, and your objective is to develop and adapt your body to the levels of intensity that will follow in later phases. Strengthening your core, strengthening your connective tissues (ligaments and tendons), and correcting your muscular imbalances are your main objectives. Strengthening your core will be explained in the Strength Training section. or a muscle group on one side is stronger than the same muscle group on the other side, like your right calf being stronger than your left. When weight training to correct muscular imbalances of the former, you can increase either the loads (by decreasing the Repetition Maximum) or the number of exercises of the weak muscle in relation to the antagonist. When training to correct imbalances of the latter, you can slightly increase the number of reps, not the weight, on the weaker side. Single-sided exercises, or exercises that use weight evenly on both sides are great for improving imbalances. A good example would be to use dumbbells instead of benching with a bar. 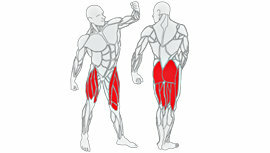 For your legs, you could do single-leg squats instead of squatting with the bar. This is because your stronger side tends to do more of the work when you use a bar. In order to fix postural deviations, you can consult with a trainer or chiropractor. At most gyms, you can get a free (or very cheap) fitness evaluation if you're a member, which can tell you what your issues are and how you can fix them. A chiropractor comes at a greater cost but can provide a better, more in-depth evaluation. It is extremely important that you strengthen ligaments and tendons before beginning hypertrophy and strength training, because they don't develop strength as quickly as your muscles do. If your connective tissues can't support the pull of your muscles, they might give. So a thorough adaptation phase is also important for avoiding injuries down the road. Loads during the anatomical adaptation phase your loads are light to medium. Reps are high. Fifteen repetitions per set are not uncommon. In my experience, circuit training is the one of the best ways to ensure all your muscles get some work. You can also try TRX Training , which involves using your suspended body weight at challenging angles, to serve as a base to your strength training program. The tempo of your exercises here will be slow: 2 seconds during the concentric portion of the rep, 3 seconds during the eccentric portion of the rep, . The goal is to keep the muscles under tension for long periods of time for each repetition. This helps to develop strength and endurance in the connective tissue. The second phase, hypertrophy, is basically the muscular development phase. I call it the "get big" phase, because that's basically what you do. The objective is to build muscle mass, specifically in the prime movers, which are the muscles that do most of the work when you play. I mean hey, you can't have strong muscles if the muscles aren't there. These muscles are developed in order to get them ready for the stress of the next phase: maximum strength. During the hypertrophy phase of periodization, loads are medium to heavy, and the tempo is slow. You want to keep the concentric part of the lift fast, but ease on the way down, so that you're not training your muscles for slow concentric movement. That would be counter productive. The goal in periodization is to progressively make your muscles, specifically your prime movers, as strong and as fast as possible, thereby developing maximum, sport specific power. In this phase of periodization, the muscles and movements used for sprinting, backpedaling, jumping, changing directions rapidly, and any other cornerback-related movements are strengthened. In the maximum strength phase, training loads are high, maximum, and super maximum (if you're performing eccentric exercises) and reps are low, between 1 and 6. The next periodization phase, power (also called conversion), is where we turn lead into bullets. In the power phase, all of the strength that was gained in the maximum strength phase is converted into power, through Olympic-lifting, plyometric, and other ballistic exercises. The goal here is to increase the firing rate of your muscles, or how fast they go, so there won't be heavy weights, unless you're Olympic-lifting. For plyometrics and ballistic exercises, most times the loads are around 30% 1-rep Max. Exercises are performed fast, with maximum effort and good technique. From there, you can cycle back down into a strength or hypertrophy phase or just maintain your gains throughout the season with a couple of short power and strength training sessions per week.